This page contains all the Destiny 2 Pulse Rifle weapons. They are rewarding if wielded with a steady hand and are meant for mid-range confrontations. The Destiny 2 Pulse Rifle is similar to its Pulse Rifle cousin, having two categories: Kinetic and Energy. However, this particular weapon may not be ideal for beginners. 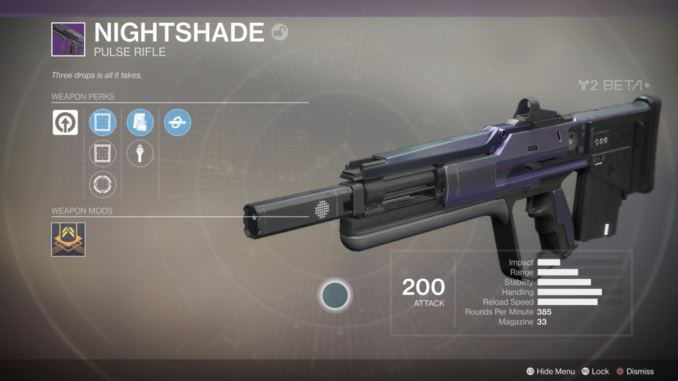 A Destiny 2 Pulse Rifle requires players to have a steady hand and often times fight at mid-range. This may not be ideal for those who are more into scouting and sniping from afar. Classes that can use this kind of weapon may be the Hunter classes due to their constant kiting strategy. They fall slightly short behind the range of Scout Rifles. *These weapons are sorted by rarity. If new Pulse Rifles appear, we’ll be updating this as well. Exotic Pulse Rifles appear more in the Beta than they do in-game. They have an extremely low drop rate, making them coveted by most players. Players can also choose an Exotic Weapon upon completing a particular portion of the game. Legendary Pulse Rifles do drop in-game. Similarly to the Exotic, they have a low drop rate. However, they do not need a certain condition to be met unless it’s a quest item. Should the player be unable to procure an exotic Pulse Rifle, a legendary Pulse Rifle can serve as a good substitute. The rares are one of the easiest to get. They’re quite a good find especially while you’re midway through a mission and you’re looking for a weapon to swap out of. These weapons drop a little more often than the Legendary and often appear in Decoherent Engrams,. If players find themselves on an uncommon weapon or common weapon then, they should immediately switch it to a rare if they can. This is probably one of the best compromises since it has a higher drop rate. The Uncommon Weapons are also easy to find. If you have a Common Weapon and you find an Uncommon then, best you replace it. In the long run, the Uncommon will definitely deal more damage. However, you’ll find yourself at a wit’s end if you’re fighting a boss like Irausk or Thumos. With both of them being increasingly chunky, you’re going to need a better weapon. Common Weapons are better off being thrown or destroyed. They don’t have much to contribute nor do they have much damage.